8th Spring Film Festival ~ Philippine Freebies, Promos, Contests and MORE! Calling all movie buffs! 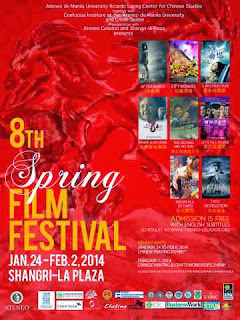 It's the season to watch a new set of superb Chinese movies in the 8th Spring Film Festival. 8 years of sharing the Chinese culture through films. 8 awesome movies to anticipate. Watch as many Chinese films as you can for FREE. The roster includes Snowfall in Taipei, City Monkey, Aftershock, Where is My Home, The Go-King and his Son, 1911 Revolution, Let’s Fall in Love, and Li Mi Conjecture. This annual extravaganza has been very successful and I know there will be more viewers to come especially Jackie Chan's featured 100th film is in the list. As always, be at the Shangri-La Plaza Mall on the scheduled movie dates at least two (2) hours before the screening time to guarantee your seat. He Zhipeng is a senior student in high school who lives in a big old Beijing hutong yard with his mother and grandmother. He loves parkour, an extremely dangerous sport in most people’s eyes. With his good psychology and physique, he becomes the star player of "City Monkey" parkour club. But his mother strongly disapproves it and hopes he could focus only on his entrance exams to university. Clashes of different concepts, rebellion of the youth, and persistence to the ideal are unavoidable problems for them. What would the two generations do?